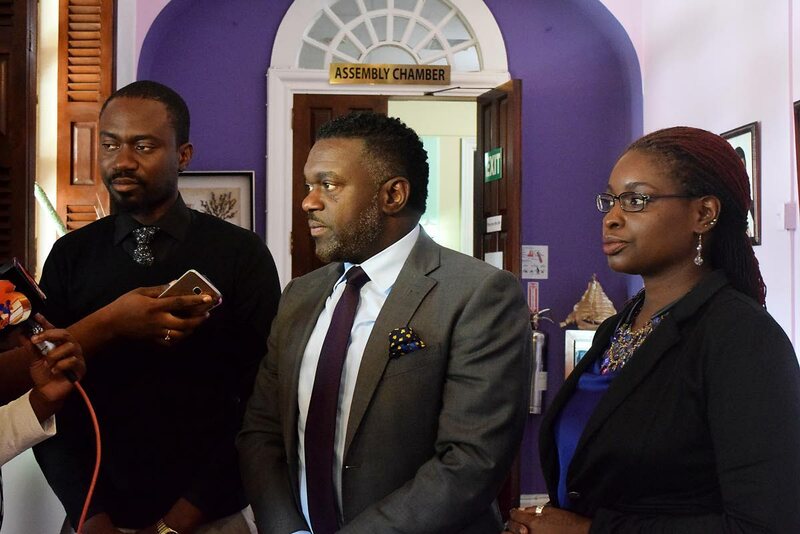 THA Minority leader Watson Duke, centre, and Minority Councillor Dr Faith BYisrael, right, have slammed the decision by the Government to give $3,000 to the All Tobago Fisherfolk Association. THA Minority Leader Watson Duke is concerned about the way forward for the fishing industry in Tobago. This comes on the heels of the All Tobago Fisherfolk Association (ATFA) voicing their dissatisfaction and frustration, having received a $3,000 subvention from the Government which has to be equally shared among the 16 fishing entities on the island, with the aim of taking the industry forward. Speaking with Newsday Tobago via telephone, Duke said the All Tobago Fisherfolk Association has every right to be upset and to feel somewhat shamed by the Office of the Prime Minister Tobago Division. “We too in the Progressive Democratic Patriots are quite concerned with what the Prime Minister places his importance on. “The All Tobago Fisherfolk represents sixteen fishing groups in Tobago, but yet they were given a cheque for $3,000 in this day and age, which means nothing – absolutely nothing. It was an insult and it was to remind them that ‘look we don’t need you, so take something' which represents something, but at the same time with which you can do nothing,” he said. Duke is of the view that such "disrespect" would be dealt with in the next General Election. “I want the Prime Minister to recognise that these fishermen are not the fishermen of yesteryear; they can read, they can write, they can spell, and they can count, and they have recognised the insignificant sum you have placed upon them and come 2020, they would deal with you. They would not forget, they would not forget the fact that you see them as not contributing to society, so there was no need to aid and support them in their quest to become better fishermen,” he said. Minority Councillor, Dr Faith BYisrael concurred with Watson's sentiments. “The amount is just silly, it’s really hard for sixteen to go into $3,000 in any meaningful way,” she said. In a press release, Minister in the Office of the Prime Minister with responsibility for Tobago Affairs and MP for Tobago East, Ayanna Webster Roy said, "the Office of the Prime Minister, Central Administrative Services, Tobago aims to ensure equity and fairness in its process of providing Financial Assistance to individuals and organizations in Tobago at all times”. Reply to "Duke slams $3k ‘insult’ to fisherfolk"